Adding a rug to your room's decor can really enhance the space, making it feel warmer and cosy, a nice space to relax after a hectic day. The same goes for outside, too. Our range of doormats come in various shapes and sizes with all manners of patterns and decorations to really sell your personality to guests to your home, or welcome them with open arms. Animal lovers will relish the cat and dog designs whilst those who love a little colour should see the stripe and pattern rainbow designs. 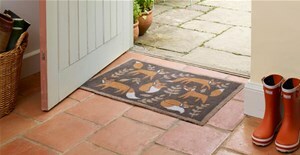 More than just eye-catching, our doormats are very practical. Designed to clean shoes and boots and keep your indoors sparkling, a doormat has to be hard-wearing. We also stock scrapers, astroturf and firmer boot brushes that regular walkers should use to clear their footwear of heavy mud. Interior mats have to be good at soaking up water. Turtle Mats excel in this regard with their super absorbent cotton, and come with some great designs that should fit into your hallway decor. They're also very easy to clean, being machine washable and able to dry in the tumble drier if needed. We also stock a large range of mats and rugs for the bathroom, from half-circles for the toilet to bath baths that you can stand on whilst drying off after a quick shower.